Hello, Insiders! If you're wondering whether you have the latest update installed or looking for a list of recent Fast or Slow builds for Office for Mac, you're in the right place. If you see the following version and build numbers when you look in the product's About dialog, you're all set. If you don't have the latest build, updates are available from Microsoft AutoUpdate (MAU). To use MAU, start an Office application, such as Word, and then choose Help > Check for Updates. If you're enrolled in the Insider Fast level, you get frequent updates with new features and improvements. The following table shows a history of recent Insider versions and builds, with the most recently released build listed first. New builds contain all the updates contained in previous builds. The following table shows the most recently released Fast builds. 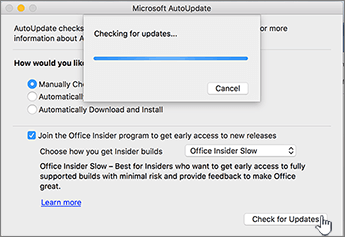 To learn about new features, improvements, fixes, and known issues in Fast updates, see Release notes for Insider Fast builds of Office for Mac. If you're enrolled in the Insider Slow level, you get a new Office 2016 feature update approximately once a month, plus subsequent builds containing important fixes or security updates. The following table shows recent Insider Slow versions and builds, with the most recently released build listed first. New builds contain all the updates contained in previous builds. To learn about new features for each build, see What's new for Office Insiders or Release notes for Insider Slow builds of Office for Mac.